Fresh water is necessary to human health, habitation and well being, but it is a scarce resource in much of the world, particularly in the arid lands of the Middle East. Accurate understanding of the sources of water, its dynamics, and the factors that determine its quality is crucial to properly managing this essential resource. This lecture will describe empirical and computational methods that have been developed for measuring groundwater flux in arid basins and for modeling its flow in complex hydrological systems, like the Arava aquifer shared by Jordan and Israel. The use of this information in developing comprehensive water management regimes will be described, with particular reference to arid land water management in the Middle East. Technology for studying and for managing water resources will be described, together with its use in management plans. International cooperation in managing trans-border water resources in the Middle East will also be discussed. 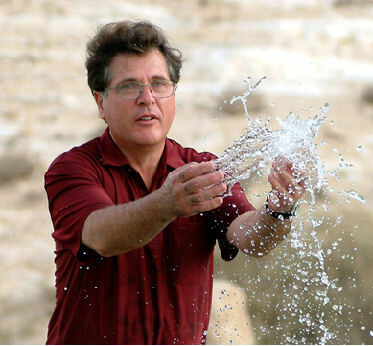 EILON ADAR is Professor of Hydrology and Director of the Zuckerberg Institute for Water Research at Ben Gurion University of the Negev. His main research activities relate to the quantitative assessment and accurate modeling of flow in complex groundwater systems in arid basins. Mr. Adar developed the Mixing Cell Model (MCM) for groundwater flux, which uses data from environmental isotopic tracers together with hydrochemical parameters to generate accurate models of groundwater flux. He first developed the MCM using quadratic programming for steady flow systems. He then refined it into user-friendly code for modeling groundwater flow patterns in multiple-aquifer flow systems. The steady flow MCM has been used to model hydrological basins worldwide, including the Kalahari Desert in Namibia, the Jezreel and Bessor basins in Israel), to the Ili basin in Kazakhstan. He has also extended the MCM to transient flow systems using linear programming. The transient flow MCM has been used to define the transient groundwater flow system and the groundwater flow contributions from Jordanian and Israeli sources in the Arava aquifer, important to both countries. Mr. Adar earned a B.Sc. in Geology, Physical Geography and Climatology from the Hebrew University of Jerusalem, a M.Sc. in Physical Geography and Hydrology also from the Hebrew University and a Ph.D. in Hydrology from the University of Arizona in Tucson. He lectures and advises on groundwater modeling and water management worldwide. He has initiated and been involved in a wide variety of hydrological research projects throughout the world. He has been involved in programs to determine the role of water reservoirs and shallow groundwater on top-soil salinization, to understand the effects of forestation of sand-dune terrain on local groundwater reservoirs; to measure and model flow and pollutant transport in fractured, low permeable aquitards, to measure pollutant sources into ephemeral rivers, to understand salinization processes in coastal aquifers, to determine the anthropological causes of top soil salinization and deterioration, and to establish sound hydrological foundations for managing water resources in the Middle East.